On Saturday 24 June 2017 the ITMA library was transformed into a sorting office. 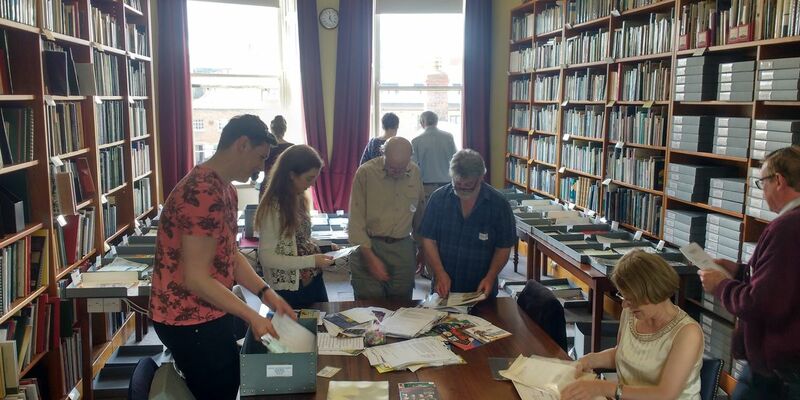 Eight volunteers signed up to help staff delve into the treasure trove that is the ITMA ephemera collection. So, what is ephemera? These are the 'transient items of everyday life' (NLI), and are often the only surviving indication that an event occurred, or to know who performed. 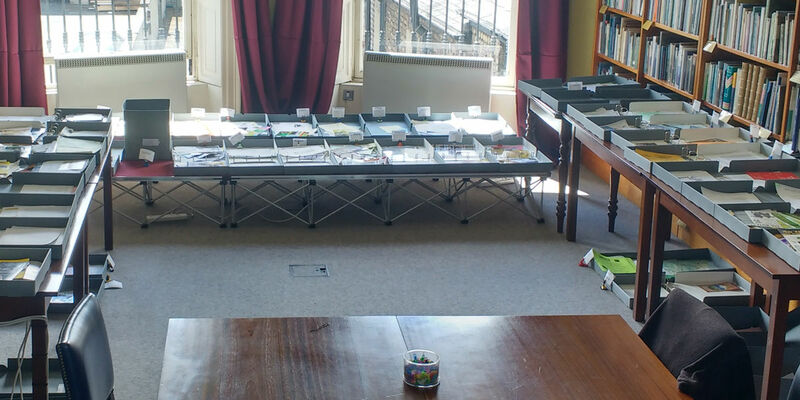 Over the last 30 years ITMA has built up a sizeable collection of ephemeral items: flyers, brochures, tickets, posters, programmes etc. The smaller items are kept in boxes that have become too numerous and too heavy to lift and only have a very basic organisation system. As a result access for the public to the material is difficult because trying to find a specific item is like looking for a needle in a haystack. Thanks to a generous grant from the Heritage Council ITMA is now able to tackle the collection and the sort-a-thon is our first step to assessing, organising and making this valuable collection available to all. Prior to the event there was lots of discussion as to how the ephemera should be organised. There was too much undated material to allow for a chronological organisation. Alphabetical organisation was deemed too difficult to implement as not everything had a title. In the end the decision was made to organise it by county, which proved quite a natural fit. 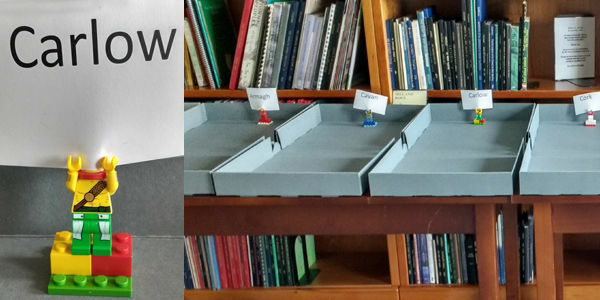 At the start of the day each county had their own pizza-style empty box, with the provinces, the Willie Clancy Summer School and Fleadh Cheoil na hÉireann allocated separate boxes. The problem of how to ensure that the labels on the boxes were clearly visible was solved using lego men – some even in county colours! Ephemera was laid out on a table at the top of the room and the sorting boxes arranged in a U shape. Volunteers took the ephemera from the table and everyone moved around to find the right box for the ticket, programme or brochure that they held. Conversation flowed as we worked and questions were asked of each other when it wasn’t clear where something should go. It became apparent that a knowledge of Irish geography was as important as an appreciation of traditional music: What’s the difference between Keady and Keadue? In what county is Portglenone/Clonmany/Clarecastle? The box for Dublin filled very quickly had to be replaced by a bigger one, followed closely by the one for Clare. Each county box did have some ephemera at the end of the day but some, like Carlow and Monaghan, were under-represented. (Can you help solve that deficit?) There was also a large amount of material from the UK and other international sources. It was lovely to hear the memories that were triggered by the material. Volunteers had attended some of the events, knew some of the performers or organisers and had even featured on the stage themselves. There were some funny stories told and the group’s attention was drawn to various interesting items as they emerged. A volunteer from Glencolmcille was particularly interested to find this flyer as neither the hotel nor the festival are still in existence. In total six boxes of ephemera, numbering thousands of pieces of paper, were filtered and organised by county. As the first step toward making this treasure trove of source material accessible to all, this was a very productive event and also great fun. There is still a lot more work to do on the remaining boxes and we hope to have further sort-a-thon days in the autumn.